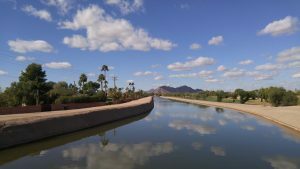 Park Scottsdale 9 is one of the best, single-family detached home neighborhoods in the south Scottsdale, Old Town Area! Located just north of MacDonald between Granite Reef and 82nd Street, it starts along Rose Lane and extends all the way to the canal. This neighborhood is conveniently located near Chaparral Park and Silverado Golf Course. Built by Hallcraft Homes, one of the more prominent builders in the post-war boom in Valley, the community broke ground in the late 1960’s with 187 Improved lots. With homes ranging in size from 1300 to 3000 square feet, the community is a mix of 130 single story and 57 tri-levels homes. Residents in this community have called it home for generations. Yards are well-maintained. Residents decorate their homes for the holidays, especially Halloween and Christmas with some of the best haunted houses and light shows in town. Call us anytime to set up a private, no obligation tour, of this community!